Not to be confused with Luke Willson. Luke Cunningham Wilson (born September 21, 1971) is an American actor known for his roles in films such as Idiocracy, Old School, Bottle Rocket, The Royal Tenenbaums, Blue Streak, Bongwater, and Legally Blonde. He was a member of the cast of the HBO television series Enlightened (2011–13). He is the younger brother of actors Andrew Wilson and Owen Wilson. Wilson was born in Dallas, Texas, the youngest of three sons of Laura Wilson (née Cunningham; born 1939), a photographer, and Robert Andrew Wilson (1941-2017), an advertising executive and previously an executive at KERA, a public television station. His family, originally from Massachusetts, is of Irish Catholic descent. All three Wilson boys attended St. Mark's School of Texas. According to Owen, Luke was voted class president the first year he attended St. Mark's. Wilson's acting career began with the lead role in the short film Bottle Rocket in 1994, which was co-written by his older brother Owen Wilson and director Wes Anderson. It was remade as a feature-length film in 1996. After moving to Hollywood with his two brothers, he was cast opposite Calista Flockhart in Telling Lies in America and made a cameo appearance in the film-within-the-film of Scream 2, both in 1997. Wilson filmed back-to-back romantic films in 1998, opposite Drew Barrymore, Best Men, about a group of friends who pull off a heist on their way to a wedding, and Home Fries, about two brothers interested in the same woman for different reasons. He played the physician beau of a schoolteacher in Rushmore (also 1998), also directed by Anderson and co-written by brother Owen. In 1999, Blue Streak was released featuring Wilson as detective Carlson. He later starred opposite Reese Witherspoon in the 2001 comedy Legally Blonde, which was followed by Old School and The Royal Tenenbaums. Wilson also had a role on That '70s Show, as Michael Kelso's older brother Casey Kelso, appearing sporadically from 2002 through 2005. In 2006, Wilson starred in Idiocracy, Mike Judge's first film since 1999's Office Space. He portrayed an ordinary serviceman chosen for a cryogenics project. He awakens after hundreds of years in an America which is significantly less intelligent. In early 2007, Wilson starred opposite Kate Beckinsale in the thriller Vacancy. In July 2007, he worked on Henry Poole is Here in La Mirada, California, which was released in 2008. He starred in the film Tenure in 2009. In 2010, he appeared in films Death at a Funeral and Middle Men. From 2011 to 2013 he starred in the HBO TV series Enlightened. Wilson and brother Owen have co-written a Wright Brothers biopic, in which they also plan to star. In January 2019, it was announced that Wilson had been cast as former sidekick-turned-mechanic-turned superhero Pat Dugan / S.T.R.I.P.E. in the upcoming DC Universe series Stargirl. 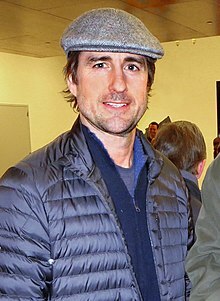 1998 The X-Files Sheriff Hartwell Episode: "Bad Blood"
2004 Saturday Night Live Host Episode: "Luke Wilson/U2"
2013 Drunk History Will Keith Kellogg Episode: "Detroit"
^ a b c d e f g h i j k "Luke Wilson- Biography". Yahoo! Movies. Retrieved October 11, 2012. ^ Stuever, Hank (July 20, 2006). "The Brothers Grin". The Washington Post. Retrieved May 11, 2010. ^ ""Legally Blonde" Movie Review". about.com. Retrieved October 11, 2012. ^ "Everybody Loves Casey". tv.com. Retrieved October 11, 2012. ^ "Idiocracy". empire online. Archived from the original on March 9, 2012. Retrieved October 11, 2012. ^ "Picks and Pans Review: Vacancy's Luke Wilson ... Checks in About Brotherly Love—and the Other Kind Too!". people. May 7, 2007. Retrieved October 12, 2012. ^ "DVD Review: Luke Wilson in "Tenure"". Orlando Sentinel. April 23, 2010. Archived from the original on April 26, 2010. Retrieved October 12, 2012. ^ Patterson, Troy (October 14, 2011). "Laura Dern Is Enlightened". slate.com. Retrieved October 12, 2012. ^ Larry King (September 26, 2014). "Luke Wilson on "Larry King Now" - Full Episode in the U.S. on Ora.TV" – via YouTube. ^ Boucher, Geoff (January 8, 2019). "'Stargirl': Luke Wilson Joins Cast of DC Universe Series". Deadline. Retrieved January 9, 2019. Wikimedia Commons has media related to Luke Wilson.